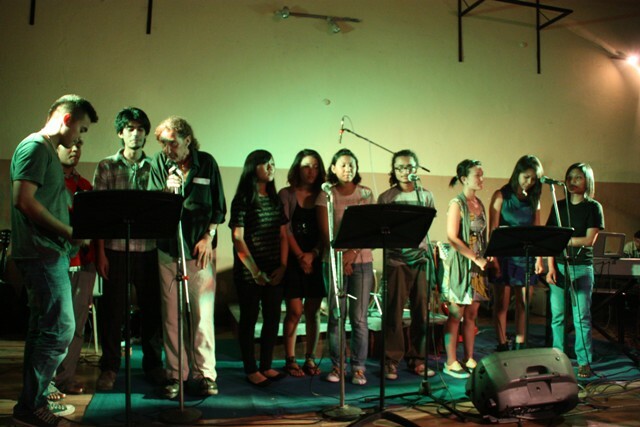 A centre for music studies, the Kathmandu Jazz Conservatory (KJC) celebrated World Music Day 2012 on 23rd June, Saturday at Moksh in their own style with a musical event. They put up a great show that featured performances by KJC choir, ensembles, solo performances and duets covering various genres from jazz to soul/R&B to rock to pop music. 1974 AD bassist Nirakar Yakthumba opened the evening gig mentioning, “KJC has always been actively promoting all kinds of music and music education” and it was clearly evident in the live acts. A music teacher at KJC, Marcus Dengate guided the audience through the show presenting performances from kids (KJC Kids Combos), modern pop songs to classic tunes, contemporary jazz with Broken Butterfly (KJC Rock Combo) ending it off. The young rock outfit also backed Prakriti Deuja. The singer was the opening act for 1974 A.D’s concert in Washington D.C. during their recent U.S. tour. Everyone present there seemed impressed by the young talents who marvelously showcased their vocal as well as playing skills. A jam session conducted by the teachers and students of KJC joined by various artistes from the music scene such as Sanjay Shrestha and Marloes Oudedman added more excitement to the already fun evening.